It’s one of the most common let-downs of the modern world. You buy into a company because they make something look easy, only to find that once you’re a customer the ‘brand experience’ goes out the window. Take insurance, for example – ‘simples!’. The other week I needed to renew my contents insurance, so I did a bit of looking around online. I came across a well-known name; the website was pleasant to look at and easy to use; it was quick to get a quote and type in my bank details. Boom – I had myself a policy with a company that seemed to have their stuff together, and that seemed to be a little more human than the rest. Then the policy documents came through – and they were the same impenetrable legal speak as every other insurance policy I’ve ever had. So it turned out the warm, friendly, clear company I thought I was buying into was just a sham. A thin veneer of brand sitting over the same old inner workings as every other company of its type. more inclined to trust the company – why wouldn’t they lay things out clearly if they have nothing to hide? The most forward-thinking brands understand that to have one tone when you’re attracting customers and then a different personality afterwards is an own goal. And when customers lose faith in whole sectors – finance, insurance, telecoms – much like they have with politics, you have a real trust issue. No one really believes any more that any one company is any different from the rest. So where do we go from here? There is a solution, but it’s not an easy one. It’s to know who you are as an organisation – what’s real and true and good about the business? What’s your personality when you’re at your best? – and then to convey that and be true to it at every point. Not just when it’s easy or convenient, but in every single interaction with customers. This might mean changing how a business works and the systems it uses, which is no small task. It’ll almost certainly mean changing people’s behaviour so that they write and speak in a way that’s true to the brand and that brings its personality to life at every interaction. A consistent tone of voice is powerful. And it’s unusual – so it’s a mark of distinction in any sector. 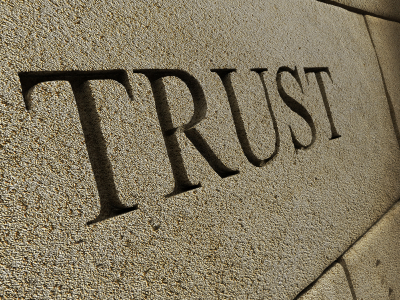 It’s one small step towards rebuilding trust in business.